The Waiʻanae Coastline, although located on the same island of Oahu that draws record-breaking numbers of tourists to Waikīkī and has a bustling downtown port of Honolulu, remains refreshingly different from the parts of Hawaiʻi that have been scrubbed of authenticity and repackaged for tourist appeal. Rounding the long bend in the road, with the last shopping center in the rearview, it feels a bit like entering a place forgotten by time. The Waiʻanae Coastline stretches roughly 23 miles to the end of the road at Kaʻena Point, considered one of the leina a ka uhane or “leaping off points” for souls in Hawaiian ʻōlelo or “storytelling.” Here in this borderland you are often alone, the only person between the mountains and the sea. But the voices of generations past can be heard in the wind sighing through the valley and the chatter of the waves amongst the rocks. For early Hawaiians, “traveling west” was a way to describe the passage from waking life into the Land of Po or “realm of the gods.” The western extremities of the islands often feature a particular rock from which the soul, separated from its physical body, would plunge into the ocean, snapping the last chord between the earthly realm and the departed. But this is not a tale about the dead and gone; rather, it’s a story about what remains in the present. 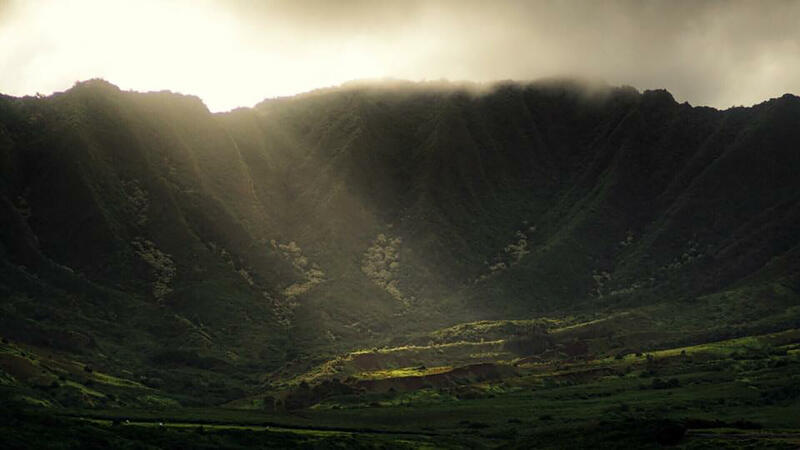 Mākua Valley is the second-to-last valley on the far western edge of the Waiʻanae Coast. Mākua, most commonly meaning “parents,” is described in legend as the place where man emerged from the womb of the Earth. Pre-contact Hawaiians created a thriving community in Mākua Valley. The ahupuaʻa or pie-shaped land division from the mountain ridges of Kahanahāiki and Koʻiahi to the fishponds offshore enabled a largely self-sufficient lifestyle, where Hawaiians created terraces for crops and an irrigation system fed by freshwater springs. Today, models of Native Hawaiian ahupua’a management are mirrored in data-driven approaches to watershed ecology espoused by conservation scientists. The territorial government of Hawai‘i that assumed control in the early 1900s following the 1893 overthrow of Queen Liliʻuokalani expedited the transition from communal land ownership, which had been the norm for thousands of years of Hawaiian control, to the Western approach of divvying up parcels for sale and lease to the highest bidder. As a result of this, Mākua Valley began to transform from family occupation and subsistence farming to the consolidation of parcels by a single landowner for the purposes of cattle ranching and commercial crops, such as tobacco and cotton, for export. Despite the decline of biodiversity in the valley wrought by cattle ranching and commercial crops in the first half of the 20th century, the arrival of the military and escalation of live-fire training after the Japanese attack on Pearl Harbor has turned Mākua Valley into an open wound and a daily reminder to Hawaiians that the Department of Defense does not prioritize the defense of Native Hawaiian tradition, culture or sacred places. The military began live-fire practice in Mākua Valley with howitzers in the 1920s while local families living in the valley went about their daily lives, leading to extraordinary accounts of children playing and adults farming while shells and bullets were whizzing above their heads. Apparently, the precautions taken around live-fire practice in this era, if given the benefit of the doubt, were loose. Following the bombing of nearby Pearl Harbor in 1941, martial law was declared and the entire Waiʻanae Coastline taken over by the military, forcing the remaining residents of Mākua Valley out of their homes — but with the proviso that the valley would be returned to the community once the war was over. With our entry into World War II the intensity of training activity in the valley increased from intermittent artillery to 500-pound and 1,000-pound bombs dropped by jets and sea-launched rockets aimed into the heart of the valley. Now, nearly 90 years since the military first began firing shells over farmers’ heads, and long after the close of World War II, the military is still occupying the valley under the auspices of “national security.” It has sharply limited the scope of Native Hawaiian access to wahi pana (sacred places or “places with a pulse”) and has dragged its feet to complete the court-ordered environmental reviews. Mālama Mākua is a nonprofit organized in the 1990s to challenge the military’s continued occupation of the valley and request access for the practice of Native Hawaiian Traditional and Customary Rights as delineated in the Hawaii State Constitution (Article 12-7). Despite having brokered a settlement agreement with the army in 2001 in partnership with Earthjustice, the group has had to remain vigilant, continually bringing the army back to court to comply with the terms of the settlement agreement: most importantly, a halt in live-fire training until proper environmental review has taken place and to allow for Native Hawaiian access irrespective of the type of training the army is allowed to conduct. I spoke to David Henkin, an attorney for Earthjustice who has been representing Mālama Mākua in over 20 years of litigation, to understand what progress has been made since the outset of litigation, what the army’s intentions are and when can Native Hawaiians expect to finally regain control in order to mālama or “care for” the wounded valley. David walked me through the various stages of litigation, beginning with the lawsuit in 1998 demanding the army assess the environmental impacts of 56 years of live-fire training, Federal District Court Judge Mollway’s historic decision to halt the live-fire training at Mākua Valley, and the 2001 settlement. This settlement, despite being negotiated over 17 days in the shadow of the Twin Towers, brought unprecedented access for Traditional and Customary practitioners in an active military installation and allowed only limited live-fire training until 2004, at which point live-fire training has been held up indefinitely until the army’s completion of an Environmental Impact Statement (EIS). While the army initially argued that its operations in Mākua were “irreplaceable and vital to national security,” in the 14 years since the cease of live-fire training in Mākua the force of this argument has faded with each passing year the military has found alternative places to conduct training and leaders have continued to sign off on unit readiness reports. 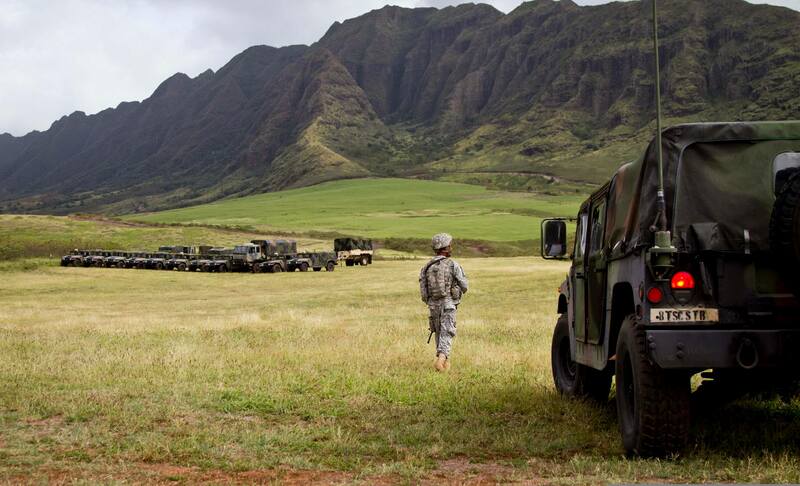 Soldiers with 8th Special Troops Battalion conduct a command post exercise at Makua Valley military reservation, Oahu, Hawaii, Feb 27, 2012.
Who in their right mind, in the 21st century, would look at a sacred valley like Makua filled with cultural riches and endangered species and say 'Let's bomb this! Going forward, Henkin points out two things that are coming to a head. First, the completion of the army’s EIS process could provide them with a better position to resume live-fire training. The public needs to be reminded of the risks of live-fire training — from the incineration of endangered species in the valley, to the possibility of contamination of the resources collected from the sea, to the disregard for sacred cultural places. The second is the expiration of the military’s lease of parcels of state land in Mākua Valley in 2029. The renegotiation of the lease between the Department of Defense and the State of Hawaii provides a rare point of leverage to advocate for change. It is in the public’s interest that any negotiations of a new lease term do not happen behind closed doors, like the previous lease of $1 for 65 years with the army’s discretion to train, bomb and burn the valley, as they see fit. And the upcoming gubernatorial race, opening of a congressional seat and shifting terrain in the State Senate all offer a prime opportunity to press politicians on their stance for the future of Mākua. I spoke to Sparky Rodrigues, one of the long-standing Mālama Mākua members, whose ties to the West Side of Oahu run deep, from his grandmother teaching him to swim and fish in the waters, to his father working as a mechanic on heavy machinery used to mine the sand, to his wife Leandra’s time living amongst displaced Hawaiians on Mākua Beach. But the term “displaced” couldn’t be more inaccurate. The choice of Hawaiians to make their home in this place is highly intentional; Mākua, like a parent’s embrace is warm and welcoming, and the mālama or loving care flows equally between person and place. U.S. 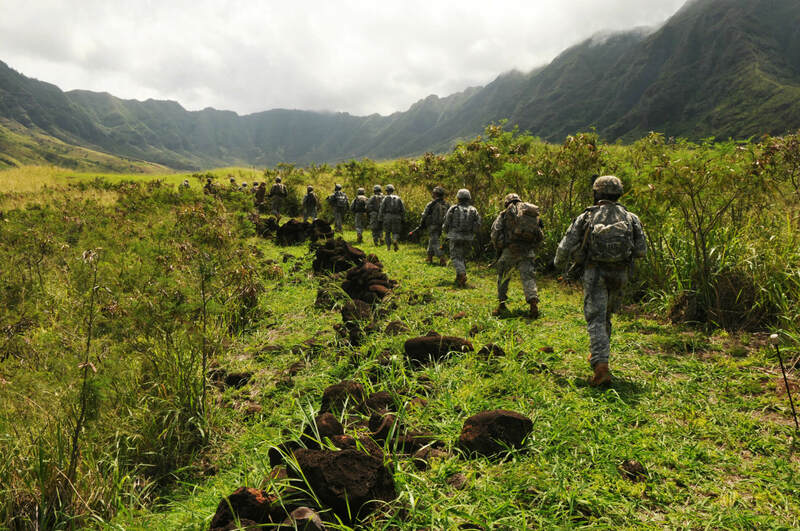 Soldiers assigned to the Bravo Company, 3rd Squadron 4th Calvary Regiment, 3rd Brigade Combat Team, 25th Infantry Division, move through an area during a training exercise, April 16, 2013 at Makua Valley, Hawaii. Rodrigues described the frustration Mālama Mākua has long-endured with the degree of access granted by the army and being at the mercy of each new commanding officer. As it currently stands, there are two daytime visits per month and two overnight visits per year, but the scope of access ebbs and flows with each change in leadership. 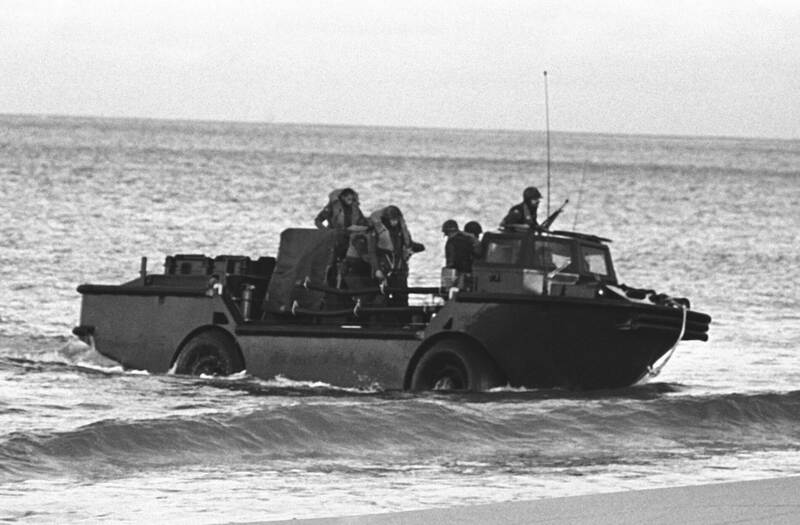 In the past, Kūpuna or elders were allowed to ride in the military vehicles that accompany the access group; but in recent years, commanding officers have declined to allow Kūpuna to ride in the vehicles, thereby largely denying access to the older and physically limited members of the community. At times, the army has also been manipulative. In one instance, in an effort to extract a concession from Mālama Mākua, the army instructed their contractors to stop mowing the grass around a set of petroglyphs. The high grass limited visibility and made the area inaccessible, because the nonprofit was unwilling to sign a new agreement including language opening the door for live-fire training to resume. The symbiotic relationship between person and place at the crux of traditional Hawaiian practice is thwarted by current limitations from the military and the potpourri of unexploded ordnance that litter the valley. One can only look and observe the surviving beauty amongst the open wounds of what 80 years of bombing and “controlled” fires can do to a once fertile valley. Not only is access limited in the present but due to the high likelihood of contamination in the soil, sand and water, along with the military’s reluctance to clean it up, the risk of encountering unexploded ordnance or slowly poisoning oneself by eating limu, an edible seaweed collected at the shore, severely limits a Hawaiian from practicing her Traditional and Customary way of life in Mākua. In the face of obstacles, the stacked deck of the military and a valley littered with unexploded ordnance, the people fighting to Mālama Mākua remind me of the importance of staying focused on a long-term vision for the future and finding common ground. Although most of the old-growth forest in the valley has been decimated by bombs, controlled fire and/or invasive species, there is an area high up near the ridgeline composed of Kahanahāiki and Koʻiahi Gulches where you can find culturally important trees like Mamaki (an endemic version of the nettle tree) and Hawaiian Sandalwood, as well as habitat for endangered species like the gemmed tree snail and rarely seen Kamehameha Butterfly. Mamaki leaves, in particular, were prized by Hawaiian medicine men or Kahuna to raise a person’s immunities, promote healthy cardiovascular function and provide a sense of stillness and ease. It struck me as a perfect metaphor that still despite everything the valley has gone through — from cattle to commercial crops to 1,000-pound bombs — that the heart of the valley still holds the plants to heal the most susceptible of its people, the maka’ainana (the people who live off of the land). In researching culturally significant plants still growing in the valley I came across several articles on the Oahu Army Natural Resource Program (OANRP) website that described the army’s efforts “to balance the requirements of the army’s training mission with its natural resource responsibilities.” Actions aimed at preserving the ecological significance of Mākua include fencing out ungulates, combatting invasives and taking seeds and cuttings to outplant endangered species. Although a small area, it is ecologically vital and harbors the seeds for the valley’s resilience. 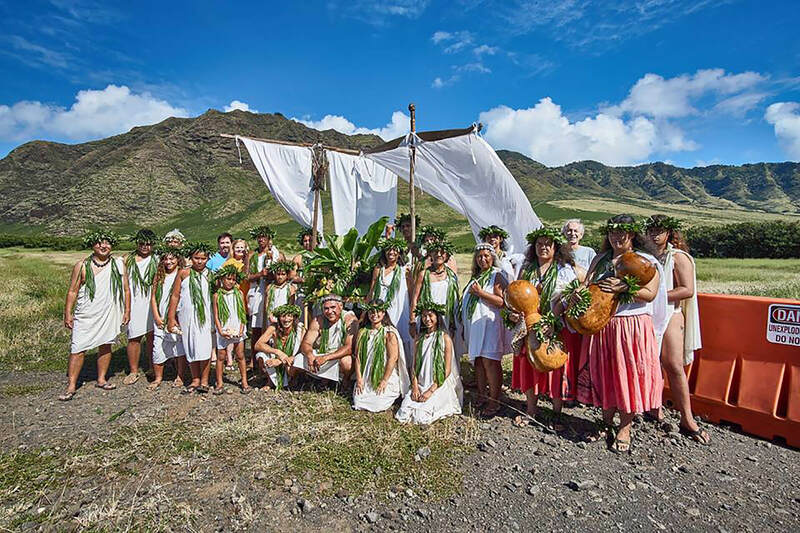 This could be an opportunity for the army and Mālama Mākua to share a common goal: maintaining the last haven of endemic species in Mākua as an open-air seed bank, where practitioners can gather culturally significant plants and exchange knowledge about methods of conservation from the Hawaiian and Western approaches, preserving some of the most culturally and ecologically significant species until the valley is finally relinquished back to the community. In speaking to the conflict Mākua has been a witness to, both in widening divides within the Hawaiian community and between locals and the constantly changing faces of the troops stationed, Rodrigues shared with me an alternative Hawaiian word for ʻohana or “family” told to him by Sam Kaai. We ALL belong to this place. We ALL share the kuleana, or responsibility, to participate in its future.